Feed your mini schnauzer more than once daily to meet her energy needs. Your mini schnauzer is a tiny scale model of his bigger kin, standard and giant schnauzers, right down to his miniature beard and mustache. Naturally active, your little guy needs a healthy diet. This breed loves to eat so your biggest challenge might be keeping his beard clean. Fresh water tops the list of nutritional needs. Keep a bowlful of clean water available at all times so your mini schnauzer can drink when he’s thirsty. The only time you can vary from this practice is when you’re housebreaking your new puppy. In that case, let your little guy have a drink about one hour before bedtime and then take up his water for the night. With rows of commercial dog food brands to choose from, picking the right food for your mini schnauzer can be a daunting task. Dry puppy food that contains between 18 and 27 percent protein is a good choice, but make sure you choose a small breed variety, which contains little chunks that are easier for tiny teeth to chew. You can feed canned dog food occasionally, but don’t make it your mini schnauzer’s main diet because the soft food can lead to tartar buildup on his teeth. Switch to a high-quality adult food when your puppy is a year old. This energetic breed burns calories quickly, especially during puppyhood, so plan to feed your mini schnauzer more than once a day. An average adult miniature schnauzer should eat about ½ cup of high quality dry food twice a day. 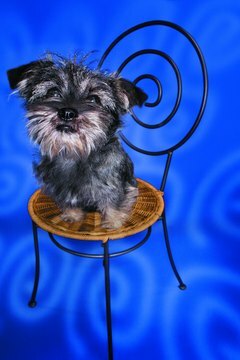 Feed younger mini schnauzer puppies three or four times daily, but don’t leave the food bowl sitting out. Schnauzers love eating and they tend to overeat if given the chance. The trick is to feed your little guy enough to provide all the nutrients he needs without making him obese. Talk to your vet if you have concerns about how much to feed. It’s natural to want to share your tasty meal with your pooch, but it’s not always s in his best interest. With a mini schnauzer in the house, any food that falls to the floor is likely to be scarfed down in record time. You can mix leftover vegetables and meats with your schnauzer’s regular kibble, but don’t feed him anything that’s been salted or seasoned, and skip the sweets. Don’t give your dog chocolate, raisins, grapes, onions or spicy foods, which can make him sick. Remove bones from cooked meat before sharing it with your dog. 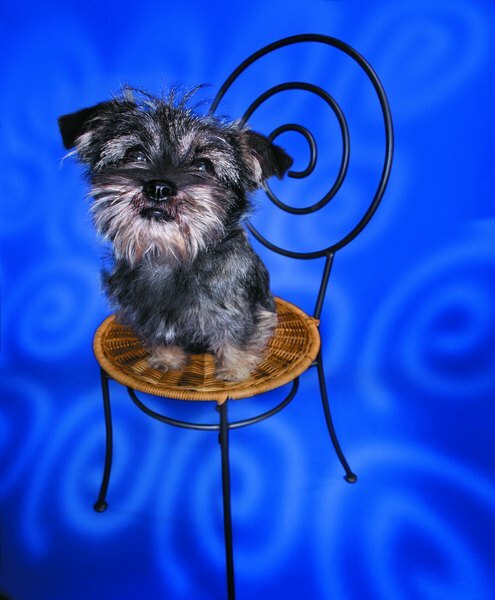 In general, miniature schnauzers are a relatively healthy breed, subject to few genetic disorders. The exception is a propensity to develop painful bladder stones that contain calcium deposits. If your mini schnauzer develops stones, your vet might restrict foods and supplements that contain vitamin C and sodium, both of which can contribute to the problem. The best practice is usually to avoid these items to begin with. What Else Can Pet Frogs Eat When You Run Out of Frog Food?